Blackstone Audio, based in Ashland, Oregon, has acquired the unabridged audio rights to four works by world-renowned author Gabriel García Márquez. 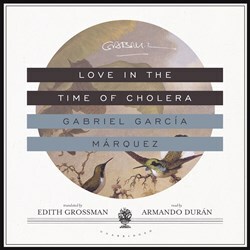 Blackstone Audio, based in Ashland, Oregon, has acquired the unabridged audio rights to four works by world-renowned author Gabriel García Márquez: "One Hundred Years of Solitude," English translation by Gregory Rabassa; "Love in the Time of Cholera," translated by Edith Grossman; "No One Writes to the Colonel," translated by J. S. Bernstein; and "Memories of My Melancholy Whores," also translated by Edith Grossman. Blackstone is scheduled to release one book each month from September to December 2013, beginning with "Love in the Time of Cholera," which will be read by Armando Durán. Thom Rivera is set to read "Memories of My Melancholy Whores," while narrators for the remaining two books have yet to be announced. The Columbian-born Márquez is widely considered one of the world’s greatest writers. He won the 1982 Nobel Prize for Literature after earning international acclaim for "One Hundred Years of Solitude," a masterpiece and defining classic of twentieth-century literature. Though Márquez himself has referred to this work as “a bit of a joke,” William Kennedy called it “the first piece of literature since the Book of Genesis that should be required reading for the entire human race.” Many others have expressed similar sentiments. Since its original publication the book has been translated into thirty-seven languages and has sold more than twenty million copies. A journalist, novelist, screenwriter, and writer of short stories and nonfiction, Márquez is also celebrated for his other literary contributions. His unsurpassed abilities as a storyteller have made him a favorite of both critics and general readers, and his works continue to win a wide audience the world over. For further information contact Rick Bleiweiss at 541-261-8777 or rick(dot)bleiweiss(at)blackstoneaudio(dot)com.